As I was getting my nails done today, I cried. Not a full-on floodgate of tears and snot gushing down my face, but tears nonetheless. Why, you ask? Well, I was at a new nail salon right next door to the one I normally go to because it was packed. 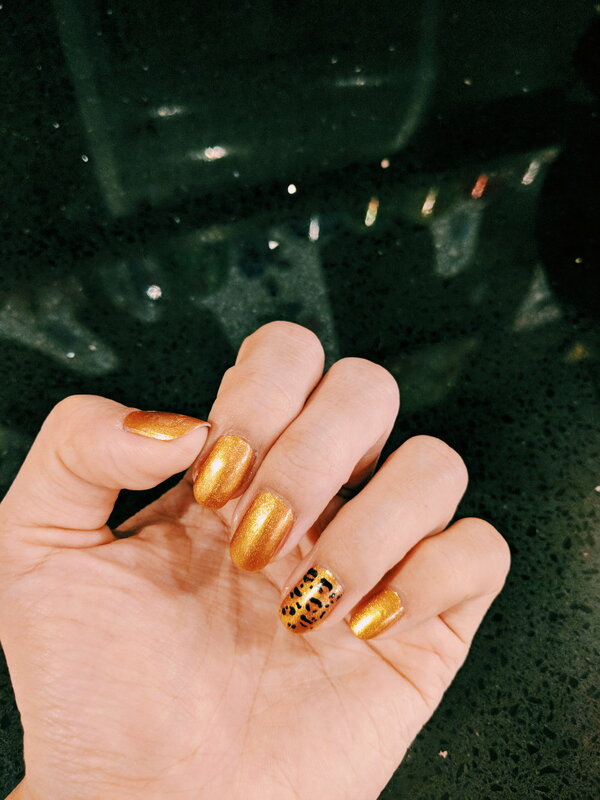 While getting my nails done, I asked the nail technician about adding a nail design in the spirit of Halloween, which I don’t even particularly like but thoroughly enjoy any excuse to celebrate. She made some suggestions but we quickly became distracted by small talk and I forgot about my serious nail art ambitions. As she finished painting my nails, she unexpectedly grabbed my ring finger and started dotting my nail with different colors, letting her creative juices flow. And this was a gift. So I cried. This small gesture gave me immense joy for several reasons. For one, she let me express myself in a funky and personal way which is important to me. The design, a leopard print, didn’t particularly speak to me but it was perfect and it tickled me. But what really got me was that she alleviated the burden of having to make yet another decision after having to make so many in my full-time professional job, relationships and personal obligations. This moment made me think about the value of the people in our lives who lighten our load, even in the smallest of ways like making Friday night plans or selecting a restaurant for dinner. For many years, I have had to learn how to rely on myself and make my own decisions. While these can be good qualities, I am in a season where I have people in my life that I trust and have my best interests at heart. I can rely on them to know what I need and to be there for me. Whether it’s the perfect words when I’m being protective with my heart in a new dating relationship or simply my favorite dessert just because, these acts of friendship make life so much easier and more enjoyable. The people in our lives are meant to enhance them, if we would just open our hearts to it. I am thankful for loved ones who help me feel lighter, freer, and more still. I thank God for filling my needs in tangible ways through friendships and feel His presence and provision in these moments. We have permission to let people in and trust that sometimes they can help take care of us better than we could on our own. In the meantime, I’ll try not to spontaneously cry in nail salons… but I don’t make any promises.